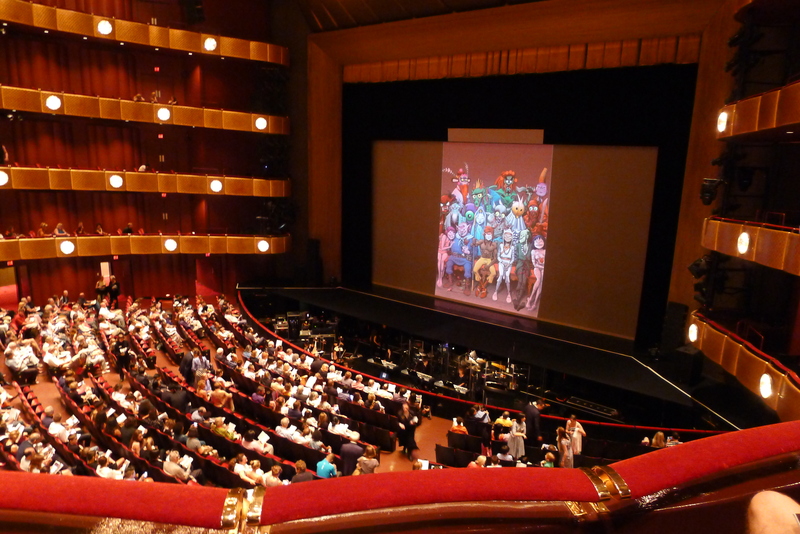 The Lincoln Center has entertained me with a couple of brilliant evenings of classical music this year – the New York Ballet, the Philharmonic Orchestra. But tonight it showed me something very different: Singing monkeys, dancing pigs and starfish suspended from the ceiling. 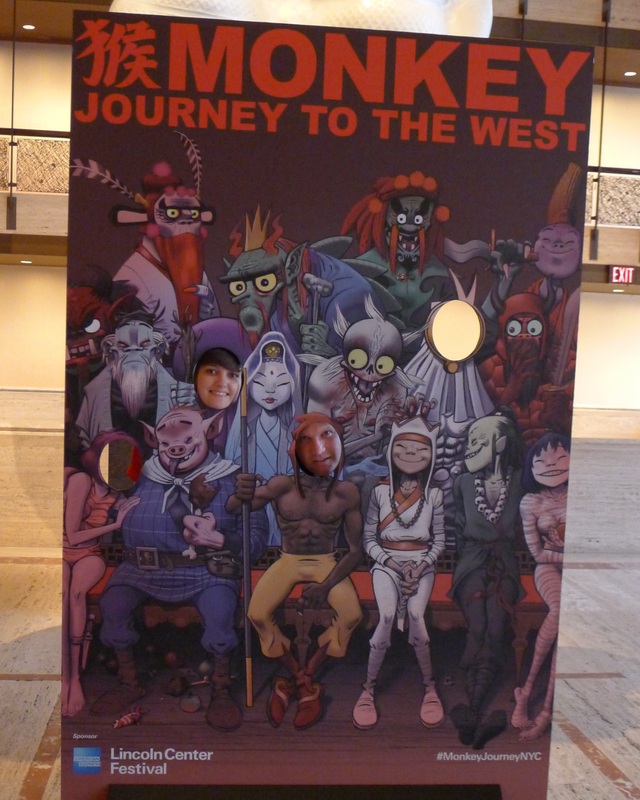 I headed to the David H. Koch Theater to watch the hotly anticipated Monkey: Journey To the West with (a very dapper) Ryan. 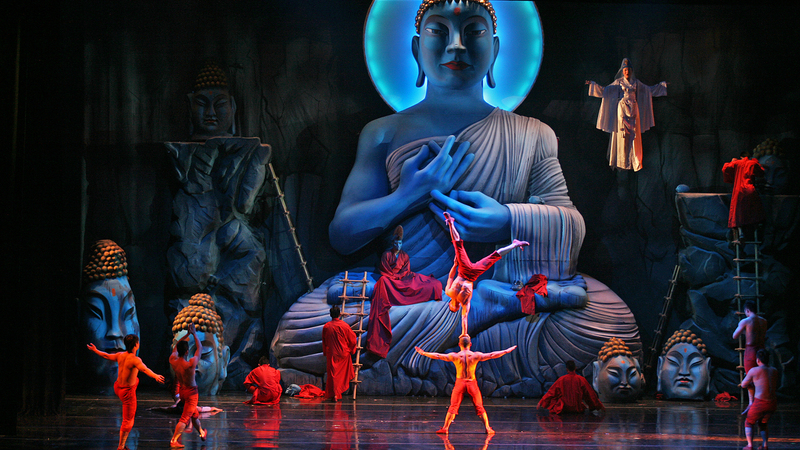 The show is a musical version of the 16th Century Chinese novel documenting the travels of a boisterous monkey. 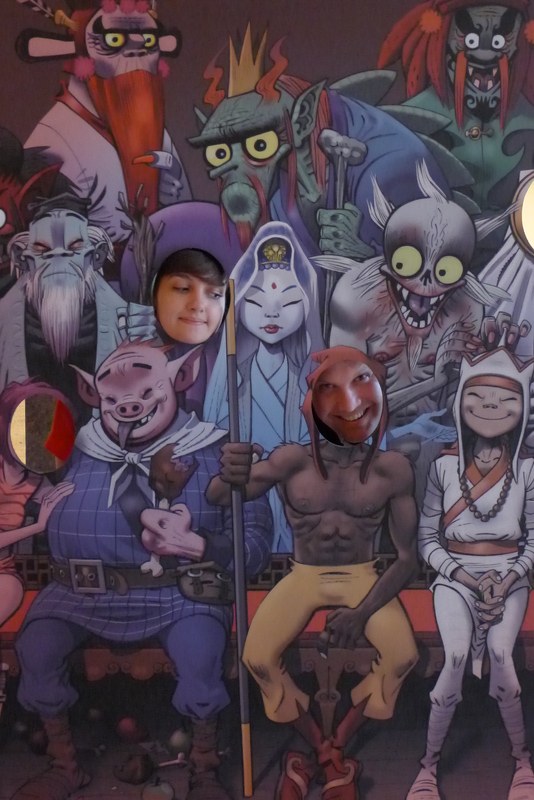 The stage version was created by the team behind Gorillaz – Damon Albarn on music and Jamie Hewlett on animation. With such a stellar team behind it – and as a Gorillaz fan – I expected big things. Unfortunately it fell quite a bit short. We met a little early and monkeyed around before settling down in our seats. 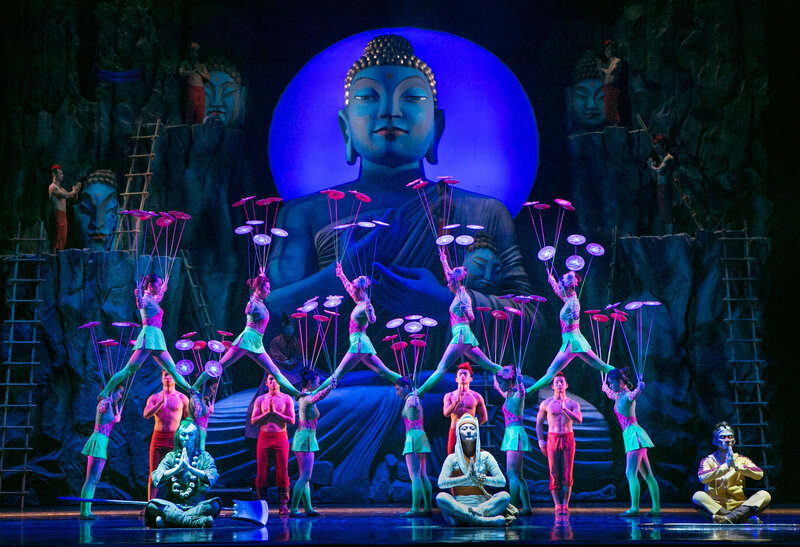 The show, which was performed in Mandarin with subtitles, started off strongly – with engaging animations showing the monkey travelling the world, and I chuckled at Wang Lu, who was really fascinating to watch in the lead role. But as he journeyed to different places scene by scene – introducing us to scores of gymnasts, contortionists, dancers and martial arts fighters – the show began to drag. There was no real story apart from ‘Look, now we’re in another place!’ and I had no understanding of the different characters who joined him, or their purpose. The most disappointing part was the music. It was largely unmemorable. I know Albarn was taking on Chinese influences, but I expected heavy bass, funky beats – and to be blown away. As it was, the score really lacked depth and dynamism, and it was only about three-quarters of the way through that a great beat kicked in and I felt like moving. I just wished the whole thing had been louder, brighter, bigger, edgier. A more defined, snappier story would have been nice too. I know I sound like a Debbie downer, but it wasn’t all bad and I did have a good evening. I marveled at the gymnastics, the endless plate spinning and an entertaining performance by Wang Lu. I definitely got a few laughs out of it. 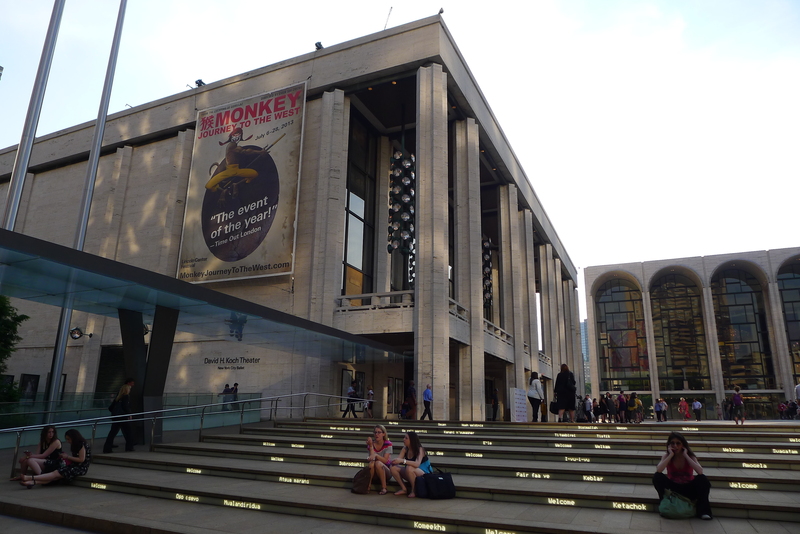 But in my opinion, the Lincoln Center should stick to what it knows best. And I’m sure I’ll head back for another of their classical gems soon.